via PVTech ‘Silicon Module Super League’ (SMSL) member Trina Solar has said it shipped over 9GW of PV modules globally in 2017, confirming its second place position in PV Tech’s Top-10 Module Suppliers annual rankings. The SMSL noted in a statement on its website that module shipments for the first three quarters of 2017 were 1,966MW, 2,481MW and 2,092MW, respectively. As a result fourth quarter shipments would have peaked at over 2,500MW. Trina Solar said that accumulated module shipments had exceeded 32GW. The top 10 module suppliers shipped 57GW in 2017, with the seven SMSL players occupying the leading positions. Nine of the companies are Chinese-based operations. Key markets for Trina Solar in 2017 were China, India and the US, while its global footprint is one of the broadest in the industry, highlighted by the fact it said it shipped and had distributed products to more than 100 countries. 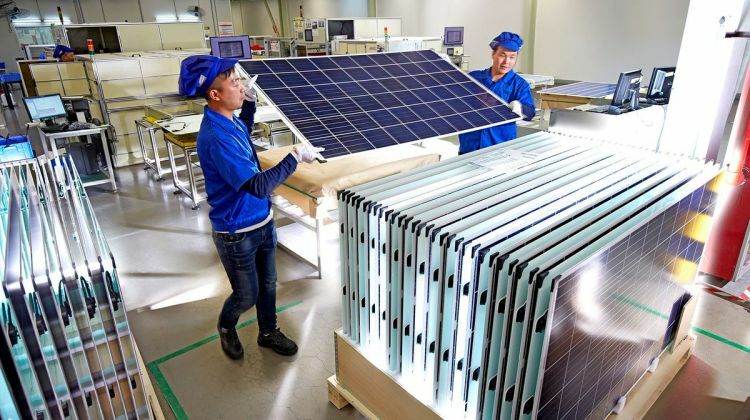 Trina Solar also retains its in-house solar power projects business, which constructs, operates and has sold projects in China, the UK, the US and other European and Asian countries. The SMSL also noted that it had shipped over 3GW of modules to India in recent years, accounting for more than a 25% market share, according to company. However, the China market has remained its largest market in the last few years. The company noted that in August, 2017 it launched its residential PV brand – ‘TrinaHome’ in China, which it claimed has quickly taking leading market position in the Distributed Generation market. The Company also noted that it was implementing the ‘One-Million Rooftop Plan’ over the course of the next five years to provide the Trina residential PV system installation service for more than one million households. Trina Solar’s commercial projects were said to have achieved 500% growth with businesses covering 20 Chinese provinces and cities nationally, with strategic plans over the next three years in developing around 1,000 commercial partners to achieve over 10 million system sales. PV Tech’s ‘Top-10 Module Suppliers in 2017’ has recently been published and has in recent years become the most widely accepted benchmark of leading global solar module shipment rankings in the industry and also remains the key metric for market share leadership and positioning. Currently, the SMSL membership is made-up of seven companies identified in the past 12-18 months as the companies that were expected to be in the 4GW-plus annual shipment level in 2017, forming an exclusive grouping. SMSLs are also characterised by having several gigawatts of manufacturing capacity and shipments separating them from all other suppliers, including several companies that were included in the 2017 Top 10 rankings.